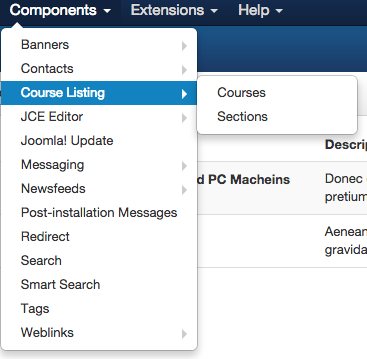 I am building a component in Joomla 3.3 to list courses and their respective sections, and provide an administrative interface in the back-end. After my component is installed, or if I navigate to other administrative sections of Joomla, the menu items relating to my component seem to, uh, lose their titles. 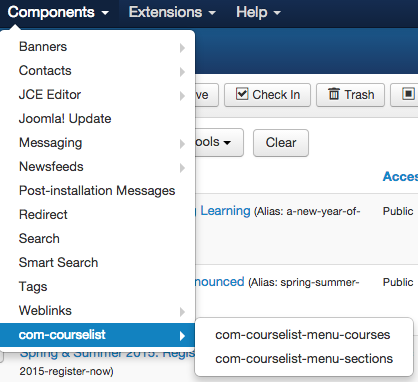 Rather than 'Course Listing' in the components menu, it will say com-courselist. Instead of 'Courses' in the sub menu item it will say 'com-coureslist-menu-courses', and the same problem for the 'sections' menu item as well. When I click on any of these menu items, the titles then change to what they are intended to be - Course Listing, Courses, Sections. Afterward, clicking to any other admin area, for example, the article manager, causes these menu items to go back to how they were immediately after install (com-courselist, com-courselist-menu-courses, com-courselist-menu-sections). Not the answer you're looking for? Browse other questions tagged component menu-item menu mvc or ask your own question.